Reflexolgoy is an ancient healing modality which promotes balance, improves overall function of the body and induces deep relaxation. Via bio-chemical, electrical, and magnetic energy changes affect related organ where pressure is applied reaching homeostasis. Specific formulative and rhythmic pressure is applied for relief of stress, lack of slee, headaches, all reproductive system related issues, lymphedema, and treat pain and relief to pathology symptoms of the body. Massage and Reflexology is not the same thing. Most massage therapist are NOT trainined nor certified in reflexology. 390+ 100 clinical hours certification traininging in reflexology is very diffrent from one week of training in massage school. You wouldn't say massage and acupuncture is the same thing, No! Reflexology is not a foot rub. A foot soak and Swedish and Sports massage techniques are terrific and feel good, however it's very different from reflexology. There is a formula that's used to treat headaches and another formula for constipation and so forth. Each formula is created to target and to help treat pain and pathologies of the body. That's the difference! Toe2Heal is focused on treating you with clinical reflexology for your whole being, over-all welllness. 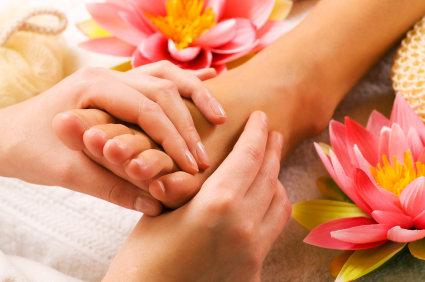 Reflexology promotes balance, improves overall function of the body and induces deep relaxation. Via bio-chemical, electrical, and magnetic energy changes affect related organ where pressure is applied reaching homeostasis. Light pressure is applied to invisible reflex maps found on the feet, hands and ears, which correspond to the body organs stimulating to the nervous and subtly energy systems. Back-up of toxins in the body can cause pain, hormonal imbalance, and eventually show up on the outside in various forms, such as puffiness, swellingness, puffy eyes, acne, sciatica, plantar faciitis, high cholesteral and other illnesses. Regular energy bodywork can promote internal balance and enhance outward beauty of skin. Working all reflexes associated with the client's condition is so important because it can stem from a different organ inbalance. One client that is overweight may have sluggish thyroid causing a slow metabolism, however another client can be overweight because of a pancreas disorder that causes cravings for sugary snacks. Reflexology sends healing energy along the body's energy pathways and can have immedite effects. Book 60 minute massage with foot reflexology, you will love it!